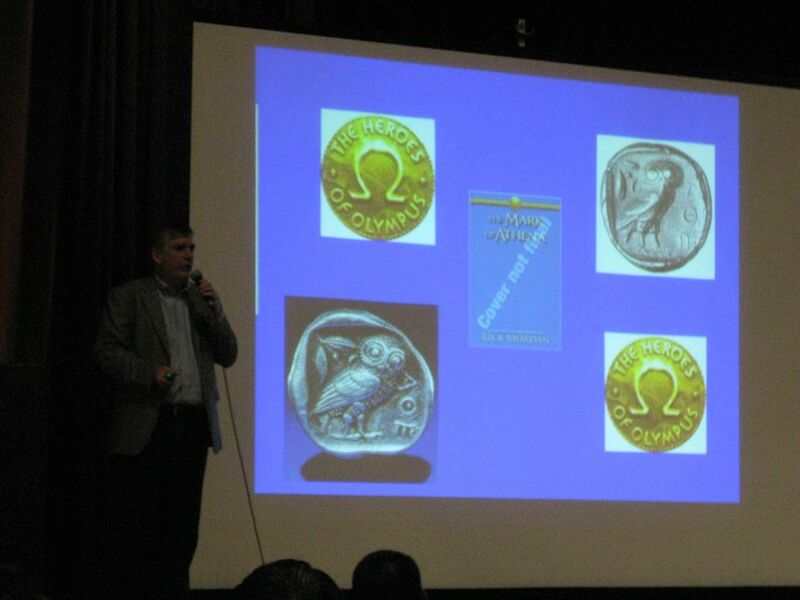 Last Thursday, Vancouver retailer Kidsbooks hosted a 45 minute Q & A with Rick Riordan, author of the Percy Jackson Series at the Hellenic Community center in Kitsilano. 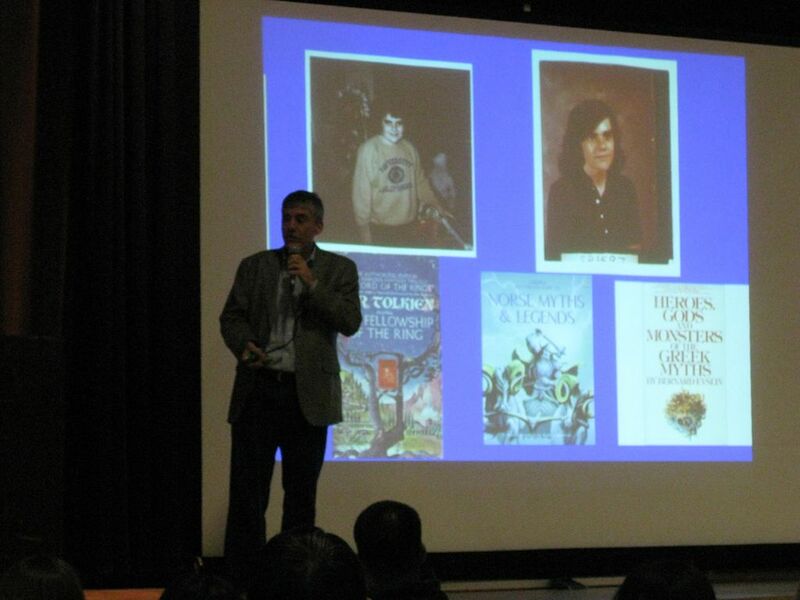 Riordan gave a retrospective of the influences (and the hairstyles) that led up to the creation of the hit young adult series, including Lord of the Rings, Norse Myths & Legends, and of course, Heroes, Gods, and Monsters of the Greek Myths. This is a picture of Riordan’s first manuscript for Big Red Tequila, the first novel of his murder mystery series for adults, published long before the Percy Jackson Series. Percy Jackson came about through a couple of factors. Riordan wrote all his books while he was a middle school social studies teacher, and he wanted to write something for his students without quite so many swears. The second factor was that his son, a reluctant reader, was so enamoured with the Greek myths that they had run out of myths to read together. So, Riordan wrote some new ones in the form of Percy Jackson. He also showed off some of the international covers. This is the German cover of The Lightning Thief, which is the only depiction of the minotaur I’ve seen with actual tighty-whities. 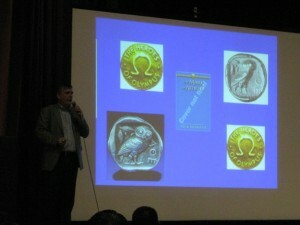 The fans were then treated to a sneak preview of The Mark of Athena, the next book in the Heroes of Olympus Series. For the price of admission, everyone also got a signed copy of The Serpent’s Shadow, the third and final book of the Kane Chronicles series. 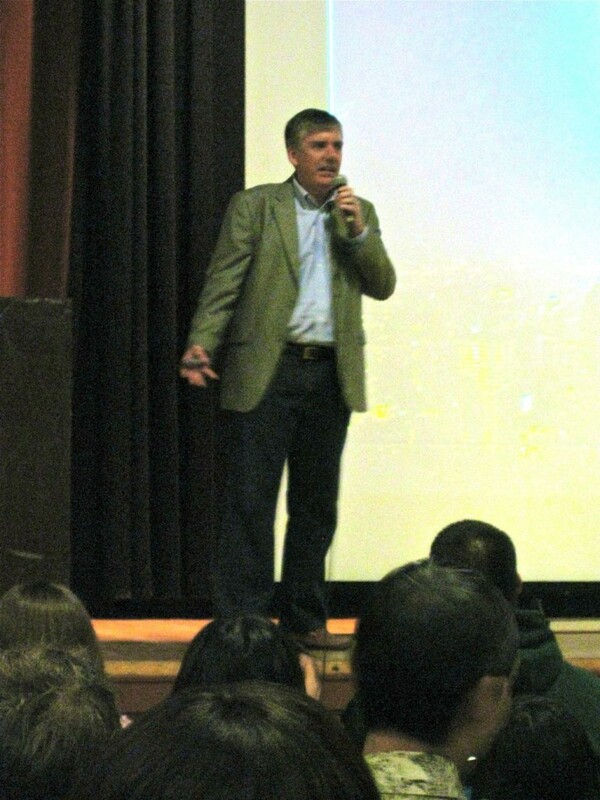 Even though it was mostly an audience of kids and parents, I highly recommend seeing Rick Riordan speak for anybody who’s interested in writing fiction. 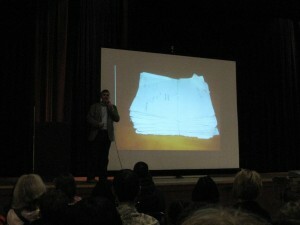 He is an incredible speaker, and his journey is an inspiration for anyone who wants to put pen to paper. Seattle and Vancouver were settings in one of Riordan’s books, so it’s likely he will grace us with his presence again.